The media exprimo, launched in the October of 2006, will be completed in the end of March, 2012. 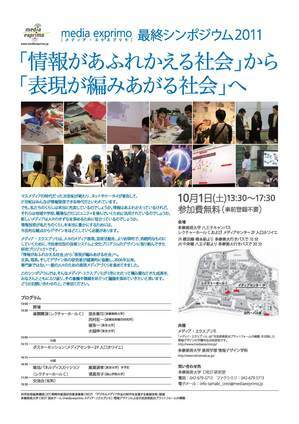 This is an information of the final symposium held in the afternoon of October 1st at the lecture hall C, etc. of Tamabi Hachioji campus. We will inclusively present and discuss this five and a half years project. Please join us to get the bird’s eye view of this citizen oriented interdisciplinary project! RSVP is not required.